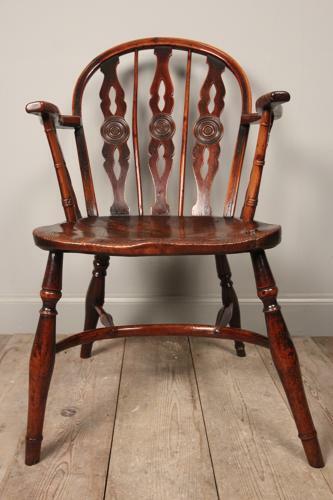 A lovely example of a Prior low back Windsor Chair. The chair made all in Yew Wood with a solid Elm saddle seat, having a curved back rail with 3 pierced shaped back splats with central roundels. Further splats with central roundels under the shaped arms, with a bamboo spindles to the forefront. The whole raised on 4 turned legs adjoined by a crinoline stretcher. The most superb colour and patina throughout this characterful chair.